Last night I saw the revival of David Rabe’s Streamers at the venerable Roundabout Theater. Unlike last week’s fiasco, this show was compelling and perfectly cast. I don’t recall ever seeing a bum show at the Roundabout Theater Company. Those guys have the magic touch. The story takes place in an Army barracks in 1965 Virginia. The Streamers of the title is what you see when you jump out of an airplane and your parachute fails to properly deploy. I’m sure that’s a metaphor for something integral to the plot but that stuff always gets by me. Four soldiers await orders to Vietnam but the play has very little to do with war. It’s a clash of culture, education and race. There is unrequited love, blood and death. Really forceful stuff. I liked it. Streamers originally opened in 1976 at Lincoln Center and was directed by Mike Nichols. In 1983, it was made into a movie directed by Robert Altman and starring Matthew Modine. David Rabe wrote the screenplay as well. I haven’t seen the film. Do you know if it’s any good? 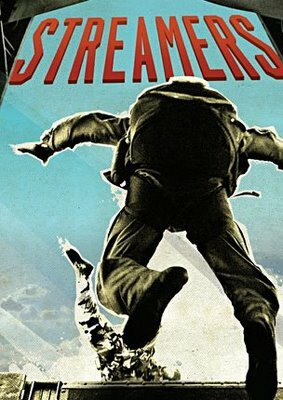 I have not seen the movie “Streamers” so I can’t comment. The only Altman flicks I have seen (after checking his filmography on line) were Popeye(1980) and the first part of “A Prairie Home Companion”(2006), which had a few laughing moments but otherwise couldn’t keep me awake.The social commentary in “Streamers” may have been ahead of or at the front of the curve in 1983. I only recognize Matthew Modine and David Alan Grier in the cast. Grier is often pretty good, although that would have been early in his career. I’m lukewarm about Modine, he’s never really impressed. But it was likely early in his career as well.We don’t have it in our library, so chances are I won’t see it. If you do, let us know if it’s any good and perhaps I’ll endeavour to find a copy at a video store. Given its age, it’s probably only available on VHS, though. Sounds like something I’d enjoy. Thanks for the tip. rob: I’m curious to see the move as well, but am wondering if I have to resort to VHS. How archaic! Also, even though he has a career in comedy, David Alan Grier was trained at Yale drama school and can handle the heavy stuff. digital: I don’t know what your politics are, but a significant plot point involves gays in the military. It’s the unrequited love I referred to. I thought I should mention that. If that’s not an issue for you, then you should definitely check it out. I read your profile and you might get more out of this than most. Thanks for the heads up UB! I’m still interested in watching it though.I’d say that there is a lot of love, straight/gay – platonic/sexual, in the military, comes with working so closely with people in sometimes high stress situations. Was in the military for ten years – I’m not gay or homophobic – Never had an issue with gays in the military. In my own opinion a person’s sexual preference is their own business and shouldn’t disqualify a person from performing any certain job.